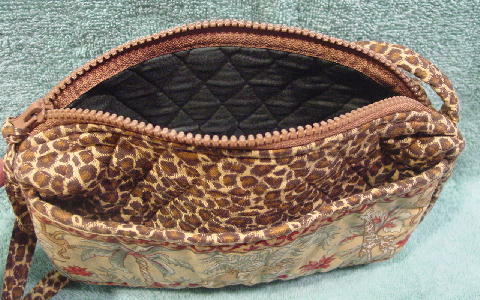 This animal print 100% cotton purse has a dark green quilted 100% cotton lining and a 100% polyester filling (padding). 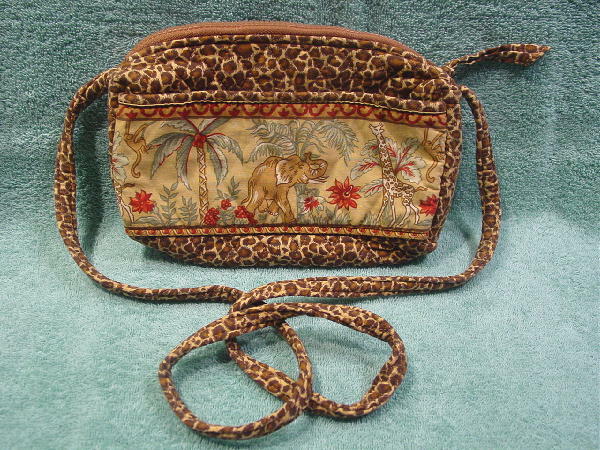 It has a top side to side zipper closure with an animal print pull tie. The front has a large open lined pocket and on the pocket front is a fabric panel with a giraffe, an elephant, monkeys, palm trees, flowers, berries, and plants in greens, reds, browns, and white on a background in light celery-tan. It has a fabric matching shoulder strap. The back just has the animal print pattern.